Ronson Crown is the most popular and probably the longest produced Ronson table lighter ever. It was first manufactured in 1936. There are two versions of the Crown. First produced between 1936 and 1948 (Newark, N.J., USA) has a radius on the top of the snuffer cap next to the flint wheel. (see pic. 2) The second (see pic. 1) one has a flat top snuffer cap and was produced from 1949 till 1954 (Canada, England, USA). There was also a butane version of the Ronson Crown lighter marketed in the 1960s called Ronson Varaflame Crown. 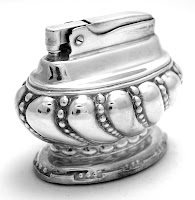 This wick lighter is handy and silver plate. The earliest versions of Ronson Crown had a red felt pad around the base rim, the others have a green one. This lighter was sold in very different configurations after 1949: with cigarette box, urn, tray and even candle holder set. The newer version was also available gold plated and rhodium plated which are rare. This model and its design was often copied by companies situated in Occupied Japan and Japan (marketed under such names as Baltic, Hilton, Sarome "Crown" and some others). There are also other options available - 10 more at least. I just purchased a silverplated tray with "Fashioned by Ronson Newark, NJ U.S.A." stamped on the bottom of it. It has feathers as handles. Do you know which lighter it goes with? Based on your description I would say it goes with Ronson Waldorf. Though to be 100% sure I would need a picture of it! i've just purchased a ronson crown table lighter with a british, us and canada patent numbers, made in england and i cant find any info on it any ideas? i have a reg number if that helps. If the Ronson Crown has a flat top snuffer it was manufactured between 1949 and 1954. I would add the markings to the post if you just could rewrite everything what is on the bottom of the base. Thanks! I found a lighter and cigarette holder with a Ronson Crown label and a patent # of 2481195.
what kind of fluid/fuel does this lighter use? is it recommended to fill and attempt usage? thanks. Ironically, I was scouring your blog this morning while collection information on table lighters for a post that I'm working on. Today, while shopping at some of my favorite "junk" shops, I came across a Ronson "Crown" lighter -and bought it. I got it for $6.00, and it's beautiful! i have a ronson crown i've just bought got it for one dollar (no joke). the hole the flint goes through is jammed with flint dust/corrosion, any idea what i should use to clean it out? also can i tell the year from the stamp? Yeah, I got mine for 2 dollars. Why? because I'm the shi*t.
I bought one for $2 also and my flint hole was clogged. I used a real small drill bit and picked and twisted the bit into the old flint until it fell through, then i had to scrape around the edges of the hole to ensure the new flint would slide in properly. I used the flint pusher to check that the hole was clear enough for a new flint. MY GIRLFRIEND PURCHASED THE RONSON CROWN LIGHTER WITH THE FLAT TOP SNUFFER CAP AT A YARD SALE IN PERFECT CONDITION FOF .25 CENTS. HOW SHOULD I CLEAN THIS?? Good question. The cleaning depends on the type of the dirt. Could you take a picture and show it to us? How or where do i get my Crown repaired? just moved into a new house and found ann old table lighter with an origonal copy of its advertisement in the nov 1947 Life mag the Queen Ann.Is it worth anything or shall i sling it out? I clean flint corrrosion out of lighters with a drill bit smaller than a flint, and a small pair of pliers (or whatever is at hand) to hold the bit while pushing/turning it.Afterwards, I clean the hole with a pipe-cleaner, and WD-40, or even naptha as a solvent. It has always worked for me,and I've done it many times. Hey I found my Crown lighter on the side of the road in a box that said FREE! The best price ever along with a few more great finds. Do I clean the tarnished silver plate? I think It gives it that old world look? Does anyone know where to find a flint that would fit and how to get a new wick in? hey i found a old table lighter in the house i just moved into it has a horse and buddy on the front and back of it with a button on top do any of you know what brand it is or how i can find any more info on it? I've just gotten one of these table lighters (identical to the one pictured above) and I've replaced the flint and refilled the fluid, but it won't work! There's not even a spark when I push the button! Any ideas? My wife fiddled with my father's Ronson Senator lighter and lost 2 small parts. What do I do? USPat RE.19.023. Kent Belanger kbelanger@nyc.rr.com. Look for a parts donor on ebay. It will cost you less time and money than to try and find the part you need specifically. After you take off the parts you need, then let you wife fiddle with the donor. Hi I just bought the tray, urn, and cigarette lighter the bottom of the lighter says Ronson Newark, NJ. USA U.S Patent 2481195 Ronson Queen Anne there is also an E or something similar stamped on the outer rim of the bottom of the lighter. Can anyone tell me the date or value of these? The bottom of the tray says fashioned by Ronson, Newark New Jersey. I have a table lighter and some kind of tobacco box/cigerette holder? Any idea what they are worth? The box is square and has four legs that it sits on, there is a design on the top of it that matches the table lighter. They both have the green felt on the bottom. I have a Ronson "Banker" pocket lighter stamped 14k that weighs 2.6 oz. It appears to have gold flakes layed on the body to make a textured/nuggety pattern. I can find nothing like it online and wonder if you can tell me anything about. Thanks, J.
i have a ronson crown turet #80881 made in england any info? I just found this lighter in my house it is the Newark, NJ version. But I also have the orginal box, cloth protector that says Ronson, it has the original flint, cleaner tool and instructions. It was never used. Is it still only work $50? The Ronson Crown is very common even mint in box. If it is the silver plated version it is worth $30-40. My parents died a couple of years ago, and I came across the Ronson Crown us pat # 2.481.195 - would I be better off keeping this and giving to my grandkids for safe keeping at least another 100 years? 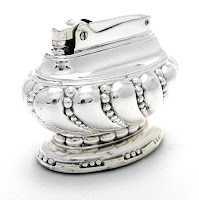 how much is the ronson crown lighter worth?should it be clean or keep the old look? I would assume it was made between 49 and 52. Depends on condition, but everything from very good to mint would be approx. $40-60. I have a Ronson "Regal" and a "Georgian" both bearing US pat. #19023 silver plated? Condition is tarnished/lacquer worn. Why is it hard to find info on them? I have the '49-54 version of this lighter. Where can I find a blowup picture of how the striker wheel gears are configured? In taking apart the snuffer to clear old flint residue from the top of the lighter down, I think I got the gear assembly wrong when I put it back together. The lever/snuffer cap move freely as they should but the wheel now does not turn to strike the flint. The lighter is in excellent and I want it out on a table and working! It has green felt around the bottom like the "Sarome Crown" but is clearly RONSON, Newark, NY. Anyone know where I can get a new flint spring. Hello, I have just come upon an oval Ronson table lighter. I have tried to search images on the internet but have failed to find it and be able to indentify it. I wondered if anyone was able to help? It's hard to describe, it's a boat like shape with not a great deal of detail. Does anyone have any suggestions? I have a Ronson Crown w/flat top made 1949-54 green felt. Does anyone know what the Number #6 or possible #9 underneath means. I believe that I have a rhodium plated Ronson Crown. Is that worth about the same as a gold plated one? I have an old Ronson Crown that does not appear to have ever been lit. I'd love to give it to my brother who has use for it but the cover does not open fully. Is there a safety to stop it from opening, and therefore prohibit a flame? It opens half way and I can see the wick and it is soft and white. I have a Ronson crown silver table lighter and was wondereing what it is worth? I have looked at many on line but cannot find this one. On the bottom it has Ronson us 19023 art metal Wks, Newark NJ USA but this is printed the long was on the bottom if you know what I mean. I have not seen any printed like this. It is completely shinny only the felt is missing from the bottom. I'm trying to repair my Ronson Crown lighter. After cleaning and replacing he flint, it no longer closes by itself. Is this model a self closing or manual closing? And if it is a self closing, any suggestions on what may be incorrect?? Try to replace the flint with a softer one. Make also sure you put the spring to the thumb lifter back! Hello! I have a ronson queen anne patent #19023. Where do i put the fuel? HI WE HAVE A RONSON GOLD AND CHROME TABLE LIGHTER,THE ONLY NO. I CAN FIND IS RD.DES.WONDERING WHAT IT MAY BE WORTH,HAVE LOOKED ON LINE WITHOUT ANY LUCK. I just fixed a Crown that would not spark. I determined that there was blockage near the wheel so I dismantled the snuffer/spark wheel for a better look. There are two screw heads on either side of the wheel. You will need use two small flathead screwdrivers simultaneously to get the smaller screw out of the sleeve screw. Watch out as it is very tiny. Next, holding a finger firmly on the top over the wheel push out the sleeve screw and carefully remove the snuffer/wheel. Be careful, there are more small parts in there that can go flying if you let the spring go carelessly. Now you can see the hole where the flint emerges and mine was definitely clogged with an old flint. I removed the flint screw/spring from the bottom and tried pushing it out with a length of wire coat hanger but wasnt making progress. I ended up finding a nail that was about the same size as the flint and by hitting the nail with a hammer was able to pop the old flint out. Replaced the flint, filed the fuel chamber and it works like a charm! Bought it at the thrift store for a couple bucks and It had been sitting unused on one of my display shelves for at least 3 years. I recently found the silver plated crown lighter made in Newark in the original box with care paperwork , original cleaning brush, and ronson price tag for $12.25 in prime condition and original cloth bag. Pat# 19023- for free. So happy its is beautiful. Hi i've just found an early version silver plated crown lighter Made in England + sigarette holder in the same shape for $10,-. Found a box of them original packaging with 10 new crown lighters never used in box. Found in storage locker amongst many more treasures. ALL FOR SALE! I have one of these lighters but mine says made 1902 wondering if this is collectable. I found this lighter with a diamond on it the bottom it says 288148-Britt on it if I'm not wrong its very old but it looks like it says Canada p.a. on it, it was also made from ART METAL WORKS INC.